A branch of the Telugu Chola dynasty ruled the Nalgonda, Mahabubnagar and Khammam regions of Telangana for 250 years. As their capital was Kandur, they came to be called as the Kandur Chola dynasty. Not only Kandur but they also made Kolanupaka, Vardhamanapur, Kodur and panagallu towns as their capitals, which flourished during their rule. They belonged to the Chola dynasty who ruled the Eruva region^As names like Danavarma and Kodur were mentioned in their inscriptions, it was the ought that they belonged to the Pothapi Chola branch. Bhimaraja-II of Eruva Chola dynasty helped Vikramaditya-VI of Kalyani Chalukya dynasty and changed his capital to Kandur. From then onwards, their dynasty was called as the ‘Kandur Cholas’. Their kingdom was bigger than the kingdom of Kakatiyas, who were the subordinate rulers of Kalyani Chalukyas. It extend¬ed to Mahabubnagar, Nalgonda and Khammam regions. 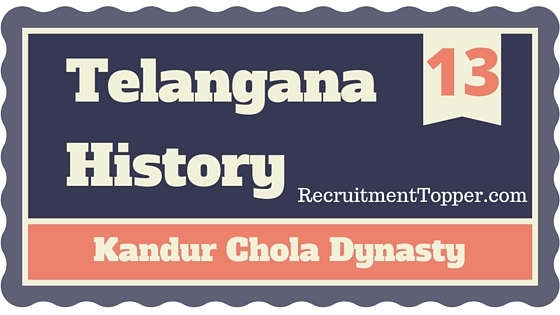 So, the history of Telangana during that period is the history of Kanduri Cholas. Around 40 inscriptions which narrated their details were found to reconstruct their history. They were written in Sanskrit, Kannada and Telugu languages. Their his¬tory was also found through the inscriptions of kakatiyas and Kalyani Chalukyas. ‘Gattu thum- ma’ inscription of Chennamahadevi, Draksharama inscription of Mylama devi and Panagallu inscription of Mylambika reveal the culture of their periods. Kanduri Cholas described themselves as’Panchamahashedda’ Mahaman daleswara, Surya-vamsodbhava kula tilaka, Koduru Puravareswara and Kasvasa gotra karikalaanvaya’s in their own inscription. But evidence was found that, during the second year rule of Vikramaditya-VI, Aija mandala in his kingdom was under the rule of Malla Maharaja of Vaidumba dynasty; which means that Vikramaditya-VI dismissed the then Aija ruler chid- dana Chola king. Ollala inscription reveals that Eruva Bhima-I ruled the Kolanupaka region after him. Eruva Bhima-I was the first ruler of Kaiidur Chola dynasty. His capital was Panagallu. He was mentioned in the Ollala inscription. His son, Eruva Tondai Chola-I succeeded him. Eruva Tondai Chola conquered the regions of Sidhikonda, Rachakonda, Devarakonda, Bhuvana- giri and Nelakondapally and expanded his kingdom. He was mentioned in the “Ollala and Kolanupaka inscriptions”. During his reign, Vikramaditya-VI of Kalyani Chalukyas appointed his son Kumara Tailapa (bom to queen Chandala devi) as his repre¬sentative to Kandur region and another son Kumara Someswara (bom to first queen) as his representa¬tive to Kolanupaka region. But this did not interrupt to the reign or control of Kandur cholas on those regions. Tondai Chola’s son Bhimadeva Chola-II succeeded him. He was given the Kandur region by Vikramaditya-VI as he helped the latter in his battles. He developed the fort of Panagallu and established good administrative system in his kingdom. His first queen was Gangadevi and they had four sons. Tondai Chola, Runaga Chola, Kondai Chola and Mallikarjuna deva Chola. Tondai Chola-II suecceeded his father Bhimadeva Chola-II. His first queen was Mylambika. Their history is constructed through the inscriptions issued by her at Draksharama and second Panagallu inscription and also through the Kolanupaka and Anumula inscriptions issued by Tondai Chola. He described Vikramaditya-VI as his sovereign in his inscriptions. Tondai-II donated to Rameswara Pandita deva and issued an inscription regarding that. Rameswara Pandita was a follower of Kalamukha saivism. Tondai Chola’s Anumula inscription contains Telugu poems. There were around 30 forts of all types- hill forts, land forts, water forts and forest forts, in his kingdom. He ruled between 1077A.D. and 1090.A.D. Tondai Chola-II had 3 sons- Udayana, Bhimadeva Chola and Gokama Deva. But his younger brothers Kondaya Chola and Mallikarjuna Chola succeeded him and ruled for some years. After Kondaya Chola, his brother Mallikarjuna Chola came to rule. He issued the Ollala inscrip¬tion in salivahana Saka year 1020. This inscription contains the complete family tree of Kandur Cholas, starting from Bhima Chola-I to Mallikarjuna Chola. It also detailed the ‘Gundava’ dynasty, who was a minister under Mallikarjuna. It described Gundava as of Atreya Gotra; belonged to a Brahmin family which was presented with an Agrahara in Vengi region by Trinayana Pallava; His family was very proficient in politics and were very intelligent. His mother was Mylamba, who issued the Panagallu inscription. She donated a village to a Brahmin for the welfare of her son Bhuma and named the village as ‘Cholabhima Narayanapuram’. This was written in the inscription. She also mentioned her other two sons in the inscription. Bhimadeva Chola also donated a village to the Markandeswara temple at the Ramalingala gudem in Nalgonda district, and issued an inscription describing it. His first queen was ‘Dennamahadevi’. She had given donation for daily worship for Tummeti Rameswara deva and issued an inscription called ‘Gattu Tummana’ inscription about it. In this inscription Bhima Chola was called as Nalla Bhima deva Chola. Somanatha deva Chola’s name came to light in an inscription found in the village of Uppunuthala. His father’s name was not given in it. So he was thought to be the son of Udayfe Chola. Udaya-Chola was the first son of Tondai Chola-II. Tondai Chola’s younger son Gokama deva also ruled a part of the kingdom, according to evidences of his inscriptions. After Bhima Chola, Gokamadeva, younger son of Tondai-II ruled between 1109 and 1136 A.D. for 27 years. His mother Mylambika described him in her Panagallu inscription as ‘Dana Kama’. He issued an inscription at Eleswaram in Chalukya Vikrama Saka year 33 and his chief of army issued another. Gokamadeva’s first capital was Panagallu. Later he changed it to ‘Vardhamanapura’ of Mahabub nagar district. His son Udaya Chola succeeded him as the ruler. Udaya Chola ruled the Kandur Kingdom between 1136A.D. and 1176 A.D. for 40 years and was very famous among the Kandur Chola rulers. Inscriptions of his period were found at Sirikonda, Rachur, Jadcherla, Nelakondapally, Eleswaram and Perur. Udaya Chola was a subor¬dinate ruler of Jagadekamalla-II of Kalyani Chalukyas. According to the inscription of Thousand pillar temple in Hanumakonda, issued by Kakatiya Rudradeva, Prolaraju-II of Kakatiya dynasty defeat¬ed a ruler called Govindaraja ahd had given this region to Udaya. This reveals that the two above dynasties were friendly. Udaya Chola had two sons- Bhimadeva Chola and Gokarna Chola. Bhima and Gokarna succeeded their father udaya Chola and ruled between 1176 and 1200A.D. jointly.They issued the mamillapally and Perur inscriptions. They donated lands to Narasimha of Chutughosha Agrahara, in Tumati Madigallu village. After them, Somanathadeva Chola, son of younger brother Gokarna, came to rule. He ruled between 1200 and 1230 A.D. But inscriptions of that period were not found. Idampally inscription, issued by his son Udayaditya deva Chola, mentioned his name. Many parts of the kingdom went to Kakatiyas during his reign. Only the capital Vardhamana pura and neigh¬bouring areas remained under his rule. He had two sons- Bhimadeva and Udayadityadeva. They suc¬ceeded their father. They ruled between 1230-1260 A.D. They were mentioned in the inscriptions found at Idampally, Padamatipally and Mallepally villages of Devarakonda taluq. Mallepally inscription nar¬rates that the village Mallepally was donated by Bhimadeva for his own welfare. Udayaditya deva donated and issued an inscription for the good of his dead father Somanatha deva and he also donated Nalladanapally prolu village to lord Maheswara and issued another inscription. It is thought that Veeramalnadha deva chola came to rule after Bhima and Udaya Cholas, though inscriptions of his period, were not found. His son Ramanatha deva chola built a temple in the name of his father and issued an inscription but did not men¬tion the name of the father of Malnadha deva. So, he was thought to be the son of Udayaditya deva. He ruled between 1260 and 1275 A.D.
Ramanatha deva Chola was the last ruler of Kandur Chola dynasty. He issued the ‘Motkur’ inscription in 1282 A.D. and described himself as the subordinate ruler of Kakatiya Rudramadevi. During , his period, Rudramadevi was ruling the Kakatiya kingdom with the name of Rudramadeva. maharaja. It was thought that Sarangapani, the Yadava king occupied Panagallu in 1290 A.D. and with that, the Kandur dynasty ended. Panagallu inscription of 1280 A.D. revealed that Tonda-Chola Bhimanarayana ruled as the sub¬ordinate king of Prataparudra but the details were not known. He might have been the son of Bhima Chola. The descendants of them were not mentioned anywhere but evidences in some inscriptions were found that they ruled in the parts of Telangana region. Rudrama Chola was described as Maha man- daleswara in the inscription of 1125 A.D. at Nelakondapally. This described the donation of Kondapally to Peddacheruvu. Another inscription at Burugupadu of Nalgonda district mentioned the name of a Kandur Chola ruler but it was not legible. It described him as Kandur Puravardhika, Suryavamsastha, Kasyapa Gotrasa and Karikala vamsastha. But the relation between them and Kandur cholas is not known. On the whole, by 1300 A.D., 17 Kandur Chola kings ruled a major part of Telangana region for 250 years. They were subordi¬nate kings of Kalyani Chalukyas for same time and later continued as subordinates of Kakatiyas and held a prominent role in the history of Telangana. ★ The ruling period of udayana Chola: –1136-1176 A.D.
★ How long this co-rule of Bhima & Gokama continued? . From 1176 A.D. to 1200 A.D.
★ The ruling period of Bhimanadeva and Udayaditya Cholas: –1230 -1260 A-D.
1. Kanduru Chola ruled which districts of Telangana region? 2. How many inscriptions are available to know about the history of Kandur Cholas? 4. Who is the first king in the dynasty of Kanduru Cholas? 5. Who helped in the wars of Chalukya vikra- maditya VI and obtained Kanduru seema from him? 6. Who is the principal queen of Eruva Bhima Chola-II? 1. 1020 – 1950 A.D. 2. 1040 – 1070 A.D.
3. 1077 -1090 A.D. 4. 1055 -1080 A.D.
9. Gokarnadeva, second son of Tondai-n, ruled the country for how many years? 10. Who will be called as famous among kan- duruCholas? 11 When did Yadava raju Saranga Pani occu¬pied Panagallu? 12. How many strong hills, land, water and forest forts were there in Tondai n king¬dom? 13. How long , the Co-rule of Bhimadeva and Gokarnadeva continued? 1. 1176- 1200 A.D. 2. 1146 – 1185 A.D.
3 1156 -1194 A.D. 4. 1156 – 1195 A.D.
15. Who is the last person in Kanduru Chola dynasty? 16. The rule kanduru Cholas continued how many years? 17. How many kings of Kanduru Chola dynasty ruled the country? 19. Among the following which regions were conquered and rule by Tondai Chola? 20. The inscription issued by Mylambika, wife of Tondai Chola II.